Harlequin Theater Guild (HTG) of De La Salle University (Manila) presents another horrifying experience you shouldn't want to miss - Haunted Hall: Our History of Horror Unveiled. 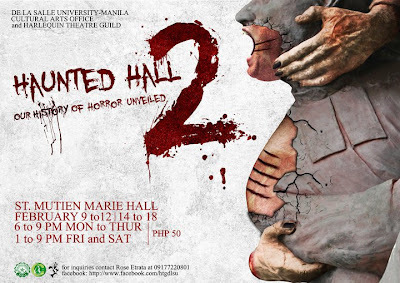 This is Haunted Hall's second year. THIS IS NOT A SHOW, BUT AN EXPERIENCE. FIRST COME FIRST SERVED BASIS, LINE CUTOFF IS 9PM. FREE GROUP PHOTOS FROM FEBRUARY 9-12. Outsiders are welcome on any given date, just present the tickets to the guard at the South Gate of DLSU Manila campus (near McDo). I didn't know that the theater group had this set up last year. 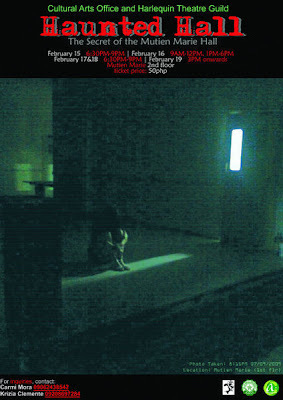 Below is the poster they used last February 2010. I'm intrigued of what's inside... Are you also curious? Then, go get your tickets now! *FAQ: Is this a play? ANSWER: No, it's HTG's version of a "horror house" that you see in Enchanted Kingdom, Star City or other amusement parks. Get connected with Harlequin Theater Guild's networks!